Hello and welcome to part 2 of my Paper Pumpkin Talk! Today I challenged myself to make alternative cards using the April 2018 Paper Pumpkin, just using the stamp set. My first card incorporated current and upcoming products, were as my second card incorporated current and retired products. For the first card, the card base is Sahara Sand cardstock, cut at 4 ¼” x 11” and scored at 5 ½”. The base layer is Tranquil Textures DSP, cut at 4” x 5 ¼”, and the next layer is Dapper Demin cardstock, cut at 3 1/3” x 3 ¼” and is embossed with the Seaside Textured Impressions Embossing Folder. The lighthouse is stamped on a piece of Whisper White cardstock, cut at 1 ½” x 2 ½”, in Smokey Slate ink. The starfish, wheel, and sailboat are stamped on Whisper White cardstock in Sahara Sand and Dapper Denim ink, punched out with the ¾” punch, and then layered on Sahara Sand or Dapper Denim cardstock punched out with the 1” punch. Before I adhered everything together, I tied a piece of Dapper Denim Baker’s Twine around the lighthouse piece. This is a simple and easy card to make, I left a sentiment off the front so it could be for any occasion. For the second card, the card base is Bermuda Bay cardstock, cut at 5 ½” x 8 ½” and scored at 4 ¼”. The base layer is from the Serene Scenery DSP Stack, cut at 4” x 5 ¼”. The anchor is heat embossed in Gold Embossing Powder in Very Vanilla cardstock, cut out with 2ndlargest Square Stitched Shape Framelit, and then layered on Bermuda Bay cardstock, cut out with the 3rdlargest Scalloped Layering Square Framelit. I used a piece of Very Vanilla Baker’s Twine, which I braided to look nautical, which I wrapped around the squares, used Mini Glue Dots to adhere to the back, and used dimensionals to adhere to the base layer. After I put the card together, I decided to add the sentiment on a ½” piece of Very Vanilla cardstock, heat embossed in Gold Embossing Powder, used the Banner Triple Punch on the end, and adhered this with dimensionals. I’m just going to share with you how I store my Stampin’ Spots, leftover PP kit items, and even the PP box! If you have a Big Shot, you more than likely have the Big Shot Die Brush which is great for getting those pesky little pieces out. I’ve seen some people use a full-size wood mount case to store this, but I really didn’t care for it and felt it was too small. What I did, is I turned one of the leftover boxes inside out (easy to do) and use this for my die brush and foam pad. This gives me plenty of room and keeps those little pieces in the box and easy to dispose of in the trash can! Stampin’ Spots-The plastic container on the left is from a big box arts and crafts store that is a 20-count jewelry/bead container that I use to store my sponges and spots. On the right is a full-size wood mount case that you can purchase from Stampin’ Up, which I use to store retired and duplicate colors. In case you were wondering, you can store 15 spots in the wood mount case! 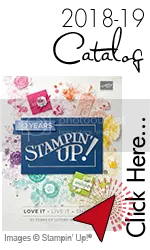 I use the Clear Mount Stamp Cases sold by Stampin’ Up! to store my left-over PP stamps and products. 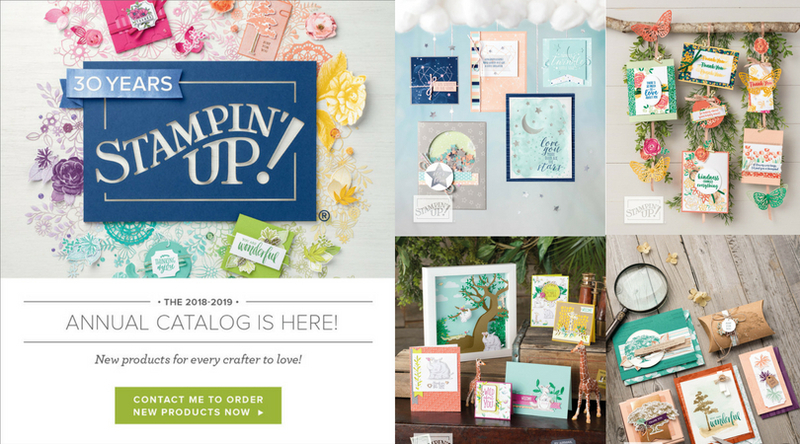 Luckily, each month Stampin’ Up! creates and provides the inserts for the case that all demonstrators have access to! These print out on a piece of 8 ½” x 11” printer paper and you can trim it down to fit. You really can fit quite a bit of left-overs in the stamp case, which is nice if you are limited on space or just like to have your PP organized. Please contact me if you have any questions about the products used on this or any other project. I hope you enjoyed today’s blog and thanks for stopping by! Previous Previous post: Let’s Talk Paper Pumpkin! Next Next post: We improve with wine!